While Swagtron is not the largest company out there when it comes to electric scooters, they are regarded as one of the best. They do not have the largest product selection, but this comes with its own benefits. One of the major benefits of Swagtron is that they are able to focus their energy on the limited selection of products they offer. I have seen plenty of companies which offer electric scooters, but very few have trimmed back their range as much as this company has. The problem, when you don’t trim back your range is that, more often than not, you are eliminating features from the scooters to try and say one particular product has an advantage. It also makes choosing which scooter is right for a person particularly tough. Swagtron also attempts to retain full control over its product chain. Since they have full control over the manufacturing process of their scooters, they are able to ensure that each and every product they offer to their customers is of the highest quality possible. In fact, Swagtron’s are easily some of the best electric scooters I have ever seen on the market. That is really something as there are so many companies out there offering them. At the time of writing, Swagtron have just three electric scooters in their range. Each of them is distinct and differs from the others, which means that choosing the right scooter for your needs should be pretty easy. I want to run you through the three electric scooters that they have, as well as listing the pros and cons of each of them. This should give you a rough idea of how to go about selecting the right one. Let’s start off with a comparison table. There are no prizes for guessing what this particular Swagtron electric scooter has been designed for. If you need to get to work in the most stylish way possible, then the Swagger 5 Elite will be right up your street. 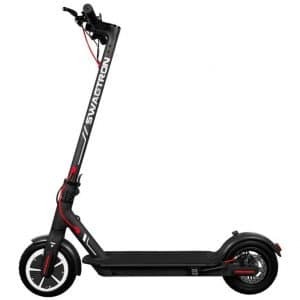 With the Swagtron City Commuter, you will be zipping from point A to point B with ease. In perfect conditions, you are going to be able to hit a whopping 18 miles per hour, which is one of the fastest possible speeds for a commuter scooter like this one. You have a range of 11 miles too, which is a significant jump up from similarly priced electric scooters on the market. All of this is thanks to the huge 250W motor that the scooter has. This scooter has been designed from the ground-up for commuting. I don’t know how many commuter electric scooters you have seen, but the majority of them do not fold up that well. In fact, they simply are not that portable at all. That isn’t going to be an issue with this one. It folds up nicely and easily. Since it utilizes an aluminum frame, you will also be pleased to know that it is lightweight too. In fact, this scooter comes in a little under 26lbs. We aren’t done with the features yet, though. Oh no! You see, this Swagtron scooter boasts a Lithium-Ion battery. This means that the battery is built to last. There will be no ‘memory effect’ like with some of the cheap electric scooters on the market. When you have finished riding this for the day, there should be no problems just sticking the battery to charge. You won’t need to fully drain the battery, which often causes a lot of problems when you are using a scooter for commuting, because the chances are that you will not be draining your battery on your commute. It only takes three hours to charge too, which means that it should be finished by when the end of the work day rolls around. The tires of the Swagger 5 are amazing too. They are 8.5 inches in diameter, which means they should be able to roll on most surfaces with ease. Of course, you should remember that this is a scooter which has been built explicitly for commuting, so you shouldn’t really be off-roading with it. I certainly would not recommend that you do that. It is going to be fantastic for hopping over uneven surfaces, though. On the handlebars, you will notice a LED display which tells you everything you need to know about what you are doing. This means information on your speed, how long your batteries have to last, and turning on your headlights. However, if you want full control then you can pair your scooter up with your smartphone. This will allow you to select the exact speed you want to use, switch on cruise control, or even use GPS. There is even the ability to flick on your headlights using the app. Although, you are probably going to run into the issue that the Swagger Elite does seem a little bit too reliant on the app. The Swagger Pro 3 Electric Scooter is not as fully-featured as the previous one, but you shouldn’t expect it to be. It comes in at a little over half the price. One area where the Swagger Pro 3 electric scooter thrives is its maximum speed. You should be able to go up to 15.5 miles per hour in absolutely perfect conditions. This will give you a maximum range of 14 miles on a single charge. There is going to be very little downtime then as well. It will take just 2 hours to fully charge the Pro 3 before you are back on the roads again. This is purely a commuting scooter. Unlike the other scooter, it doesn’t have air-filled tires. This means that you are not going to be able to travel anywhere but paved surfaces. Well, you could, but I am willing to bet that it is probably not going to be the most comfortable experience in the world. These are hard rubber tires and you can really feel the difference when you are riding on them. That being said, the cruise control found on the Swagger Pro 3 Electric Scooter is pretty much second to none. It is going to smooth out your rides perfectly. It will not be able to deal with the bumpiest of surfaces, so once again you should probably not be going off-road with it, but if your local government has not been using your tax money to fill in those pot holes, then this should pretty much cover you. The brakes are fantastic too. This is incredibly important on a scooter built for commuting, because you are constantly going to be riding in areas which have a lot of people, and you often need to slow down at a moment’s notice or you will cause somebody a serious injury. Thankfully, there are two brakes built into this scooter which makes slowing down an absolute doddle. There is no app support on this scooter, but you don’t really need it. Everything that you need to do is done from the handlebars. For example, it only takes a single button press to flip on cruise control. You will also have all the information that you need about your battery life and current speed at your fingertips. Rounding out the ‘control panel’ features is the ability to flip on your powerful LED headlamp for when the dark nights (or those really, really early mornings) start to set in. You also have the ability to charge your phone from the handy little USB charging port, although do remember that this is likely to severely reduce the lifespan of your battery, so use it at your own peril. One thing that particularly impressed me about the Swagger Pro 3 Electric Scooter is how easy it is to transport it. It is incredibly lightweight, and you can fold it up within a couple of seconds. 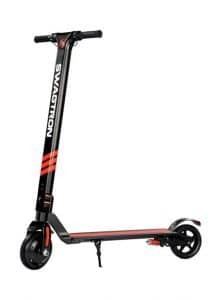 This is that sort of scooter that you can easily ride to your bus stop, then fold it up and carry it in your arms finishing your commute that way. You can easily slide it under your desk at work and it is easy to keep it ‘out of the way’ when you are at home. Basically, if you want a highly portable electric scooter, you won’t get much better than this. For the final electric scooter on this list, we are ditching the idea of a commuter scooter. The Swagger Cali Drift has been built for ‘fun’ (not that going to work isn’t fun!). This scooter has been designed to be pretty similar to the way in which a skateboard functions. In fact, many of the tricks that you are able to pull on a skateboard can easily be done on the Swagger Cali Drift. You have the distinct advantage of not needing to constantly run your feet across the ground to build up speed. 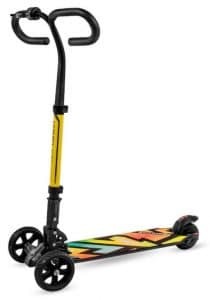 You also have a great deal of more stability on the Swagger Cali Drift than you would have on an actual scooter. This scooter is able to hit a top speed of 15.5 mph and has a range of a shade under 10 miles. However, you should really take these specs with a grain of salt, simply because this scooter has not really been built for travelling at all. It is mostly for those who want to head down to their local skate park and perform a couple of tricks, or maybe to do something off the side walk. This means that it is tough to predict how long a single charge is going to last. It is all dependent on how much strain you are putting it under. That being said, with a three-hour charge time of the lithium ion battery, you don’t really need to worry too much about having ‘downtime’. You will be up and running again before you know it. Oh, and unlike the other scooters on this list, there is no cruise control. This is something many people enjoy as it gives them full control over their travels. The Swagtron Cali Drift is going to control a little bit differently than some of the other electric scooters on the market. For starting, it has three wheels, two of which are at the front. This helps to provide you with a bit more of stability. For some people, it is going to feel a little bit odd when you first start to ride the scooter, but you will very quickly become used to it. The scooter also has U-shaped handlebars, which do not function that differently from your traditional T-shaped handlebars, but will take a little bit of time to get to grips with them. The tires are made of hard rubber, which means that you are not going to be able to go off road with this scooter, unless you have a particular love of being violently shaken while you travel. It is purely built for travelling on paved surfaces.